This month seems hellbent on getting done! Ok, a third sounds a bit more than just over a week somehow, but still. Not sure I’ll be able to keep up! So it’s not Wednesday for wips and reading, but here at the cottage it’s Fiber Friday, so there. This is what I’ve got home from the library this month and my still not very advanced holey sweater. I think I’m getting to the beginning of the end of the first two skeins, though. 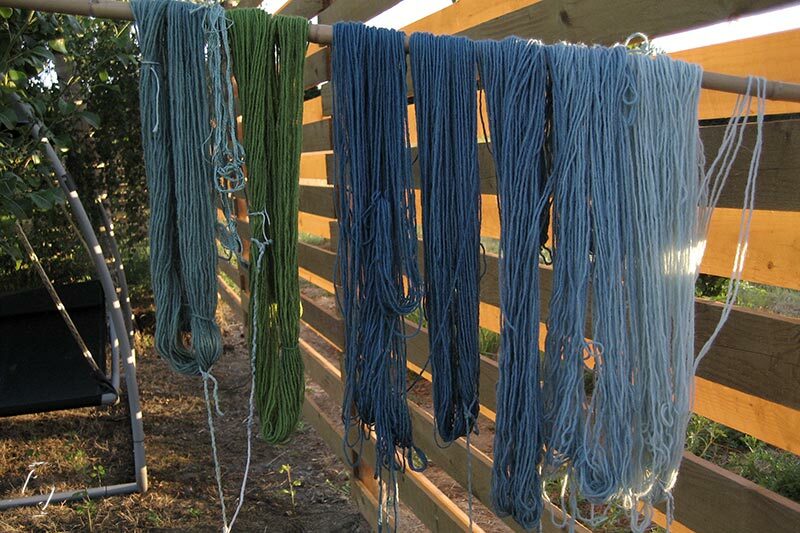 I managed to dye a bit with Japanese Indigo today, not a lot as my plants were pretty limp from the drought. I would like to do a couple of really dark blue, as well as remember to bring my silk outside too. If nature doesn’t water the garden soon I guess I’ll have to! 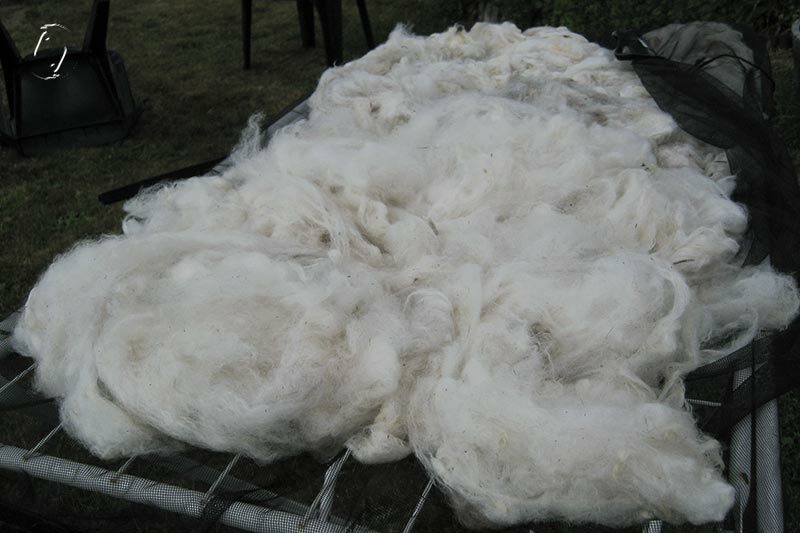 I also washed a tiny bit of fleece, the green stuff from the other day. Seems to have cleaned up well enough! The weather forecast says this might be one of the last sunny, warm days. 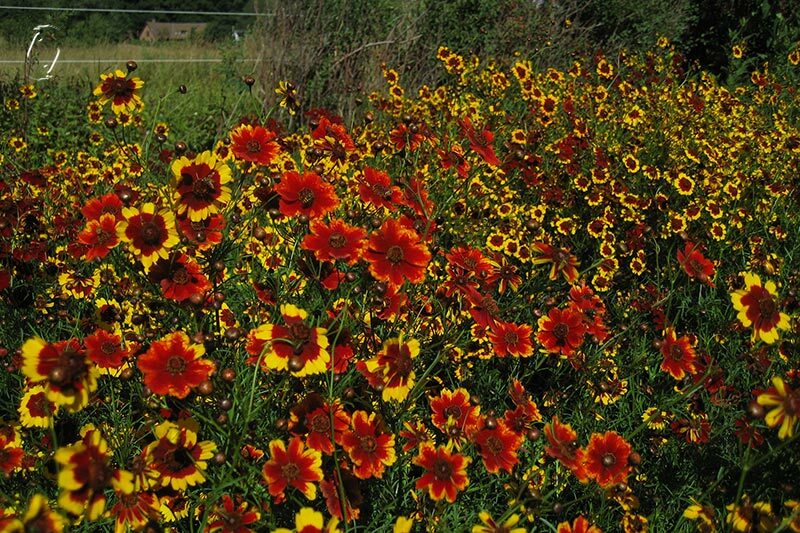 The coreopsis is running amock, there’s no way I can pick all of them! I am green with envy looking at your coreopsis, mine all died. 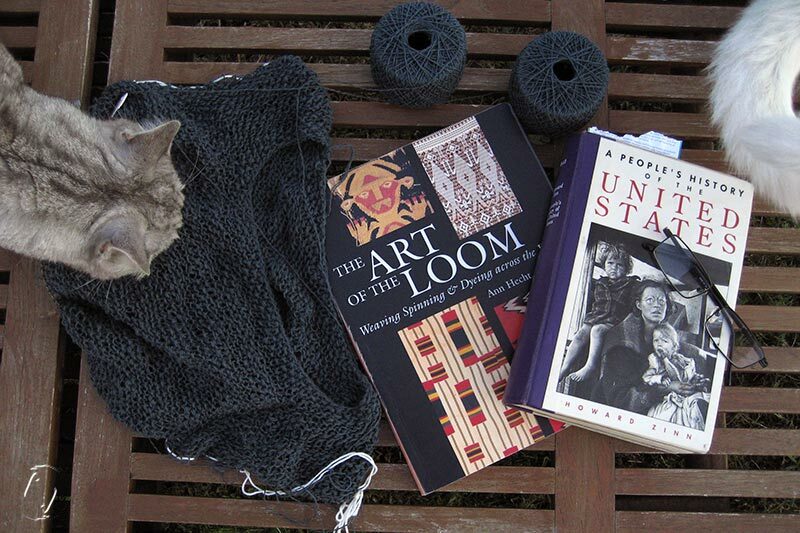 By some weird coincidence I also check The Art of the Loom out of the library this week, rescued it from the the stacks in fact! That is a fun coincidence. It’ll be interesting to compare the different methods from around the world. Okay, I figured out (somewhat) why I’m in awe of your work. Firstly, this is ancient work, and work that has a lot of mythological resonance. Which is awesome. Then, just thinking about the process itself… extracting the colors of the natural world and capturing them in these materials. Hello, earth goddess! I’m looking into making tapestries and other objects rather than just clothes, but for now, the dye process is all that I have had time and energy for. I think it was probably seasonal too in ancient times. Prepare and gather your materials in summer, make stuff from it in winter. I like your way of seeing it, perhaps that’s why I can’t help doing it, even if I sometimes wonder why exactly.